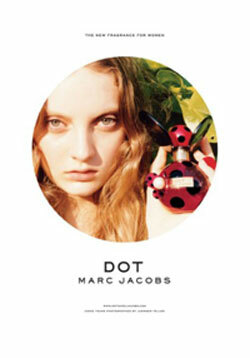 A new fragrance born into the world of beauty by Marc Jacobs, Dot. Created by Annie Gottlieb and Ann Buzantian, the perfume is inspired by ladybugs, polka dots and flower petals. An ultra feminine essence and ideal for cool spring. The composition has been announced as floral-fruity, with exotic notes surrounded by coconut palms and wrapped in the embrace of soft vanilla. Dot, features combined with red fruit pitaya, also known as dragon fruit. The opening, juicy and exciting, is followed by a trio composed of floral honeysuckle, jasmine and orange blossom, while the base is closed with a trail of coconut milk, vanilla, musk sticks and sensual. The fragrance will be launched in July this year, kicking off the summer season, meanwhile, can enjoy the brilliant ad campaign featuring the model Codie Young, photographed by Juergen Teller.